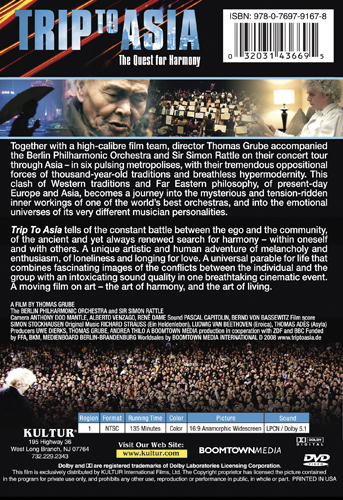 Together with a high-calibre film team, director Thomas Grube accompanied the Berlin Philharmonic Orchestra and Sir Simon Rattle on their concert tour through Asia – in six pulsing metropolises, with their tremendous oppositional forces of thousand-year-old traditions and breathless hypermodernity. This clash of Western traditions and Far Eastern philosophy, of present-day Europe and Asia, becomes a journey into the mysterious and tension-ridden inner workings of one of the world’s best orchestras, and into the emotional universes of its very different musician personalities. 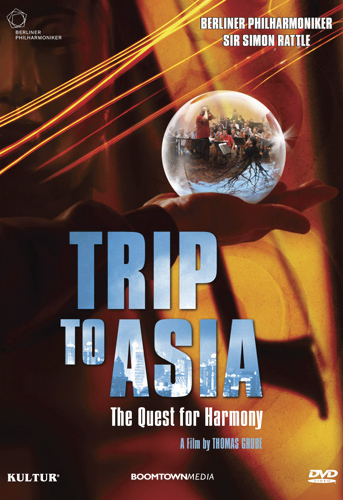 Trip To Asia tells of the constant battle between the ego and the community, of the ancient and yet always renewed search for harmony – within oneself and with others. A unique artistic and human adventure of melancholy and enthusiasm, of loneliness and longing for love. A universal parable for life that combines fascinating images of the conflicts between the individual and the group with an intoxicating sound quality in one breathtaking cinematic event. A moving film on art – the art of harmony, and the art of living.